CABLE HIGHLIGHTS: ESPN’s NBA doubleheader was at 0.75/0.57. On Discovery, GOLD RUSH jumped 0.15 to 0.79, with the lead-out hour up two-tenths to 0.58. 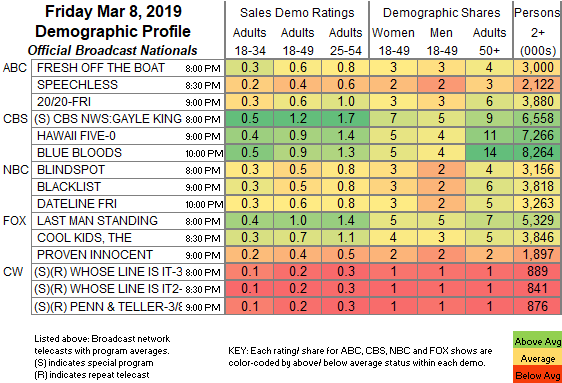 A&E’s LIVE PD gained 0.06 to 0.66. On We, LOVE AFTER LOCK-UP rose 0.07 to 0.50. HGTV’s MY LOTTERY DREAM HOUSE ticked up to 0.29. On HBO, REAL TIME WITH BILL MAHER returned from a week off at 0.26. Adult Swim’s KRFT PUNKS POLITICAL PARTY was at 0.25. Fox News’s TUCKER CARLSON TONIGHT led cable news at 0.24/0.36/2.7M, with MSNBC’s RACHEL MADDOW SHOW at 0.21/0.31/2.2M, and CNN’s ANDERSON COOPER 360 at 0.15/0.20/800K. Nickelodeon’s early-evening LUCKY was at 0.22. ID’s SECRETS OF THE MORGUE was at 0.22/0.20, compared to last week’s 0.20/0.17. 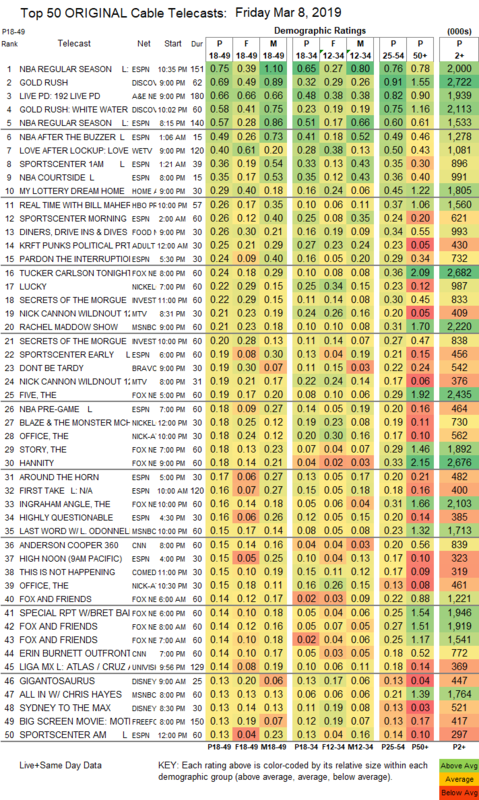 MTV’s WILD N OUT was at 0.21/0.19, compared to last week’s 0.19/0.17. Bravo’s DON’T BE TARDY dropped 0.04 to 0.19. Cinemax’s STRIKE BACK stayed off the chart, up a tick to 0.03/121K.